Discussion in 'POTW Collaboration' started by Serebii, Dec 23, 2018. Silvally, a pokémon whose very name was born from the bound of friendship it has with its trainer... I love Silvally as a concept, but Base 95 across the board and the ability to be any type makes it a discount Arceus who is a master of none as opposed to a master of all. Fairy Silvally holds a specific niche in being one of the most physically defensive fairy types in the game (only legendaries, Mega Evolutions, Tapus and Carbink have larger Defense). So making a physical wall Silvally makes sense. Multiattack makes for good STAB and ensures Silvally is not entirely passive (a problem with Carbink). Roar and Toxic make Silvally a decent Toxic shuffler, especially when paired with an ally that can setup entry hazards. Last move is up to preference. Defog and Magic Coat can stymie an opponent's attempts to setup entry hazards, but Magic Coat requires good prediction and can't deal with Screens, while Defog can wipe away your own entry hazards as well. Tailwind allows Silvally one last buff for its team before it goes down. Heal Block is a niche choice, but prevents clerics from coming in and attempting to stall out Silvally or cure the poison it is slewing. Unfortunately this set is largely stymied by the lack of natural recovery Silvally has outside of Rest. ...Save it for your enemies. Complete gimmick set, but allows Silvally to near completely sabotage a pokémon's stats and opens up opportunities for a setup sweeper to come in and setup, as the opponent will be too weakened to do anything, or will be forced to switch due to the fear of being KOd. Also works fantastically with a entry hazard setter. Parting Shot is the pièce-de-resistance, not only allowing Silvally to swap out to an appropriate counter à la Volt Switch or U-Turn, but also weakens both attackers stats, making whatever assault they had planned more manageable. Z-Parting Shot is amazing, adding a full heal for the switch in of top of the above, and cannot be stopped by Taunt. Metal Sound can provide pseudo setup for special sweepers and is great for scaring pokémon who do not want to eat a special attack after their SDEF has been that badly dropped. Snarl is anti-taunt bait and can reduce SATK even more times than Parting Shot. Last move is up to preference. Icy Wind does great in sabotaging an opponents speed. Defog fits the theme by reducing evasion and provides great utility, while Thunder Wave can permanantly sabotage an opponent's speed and Toxic is just Toxic. Do not use this set on Serperior, Milotic, Wigglytuff or Bisharp. Grass/Fire/Water Pledge -Silvally gets them, making it interesting for doubles, but that's about it. Swords Dance+3 Attacks -Silvally has an impressive physical movepool and can certainly attempt to pull off a sweep with that, but due to its middling stats is outclassed in that role. Silvally is Gladion's signature Pokémon, and it's really good too. The trainer who named it is Gladion of course, as seen in the anime. Silvally is like Arceus, but different. Instead of plates, it uses RKS memories to change type. It is also weaker, but 95 in all stats is very good, so it's good attacking, defensin and at speed. it is very équilibré. Have a great Chrismtas everyone, and a happy new year! Behold Discount Arceus! I really wish the memory items boosted each type's moves, but we can't all get what we want I guess. Boost with Swords Dance to improve your offenses, use Flame Charge to either pick off weakened opponents or use it right from the start to net so greatly appreciated speed, Crunch has the best neutral coverage alongside it's STAB, and your STAB of choice comes down to either Return or Double-Edge with the former being weaker and the latter being stronger at the cost of recoil damage that affects it's longevity. Background Information - A Legendary Pokemon that has played an important role in all three big story mediums. 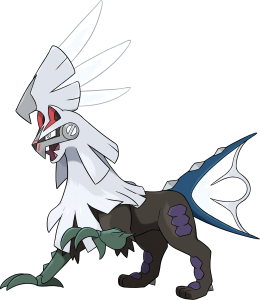 Silvally is well-known for having played a huge role, for a Pokemon anyway, in the Pokemon Sun and Moon games and it's adaptations, Pokemon Adventures and the anime and quite well. To be honest it's kind of a luxury to see Pokemon play a role in the game's storyline and rarely do we see Pokemon play similar roles in it's adaptations. For those who don't know, Silvally is confirmed to be a legendary Pokemon which was a surprise to many who thought of it as an regular Pokemon. Aether Foundations experiment was thought to be modelled after the legendary Pokemon Arceus but it proved too dangerous that they sealed it's power in Type: Null. What I find interesting in both it's Adventuers and anime counterpart is that "Type: Null" seems less of a Pokemon name and more like a placeholder name for Silvally as Type: Null breaks off it's helmet "evolving" into Silvally. In Pokemon Adventures, it stays true to Silvally's original role, a weapon to take down Ultra Beasts and oh man, Type: Null is a absolute mosnter against Ultra Beasts easily taking down three powerful Ultra Beasts quickly which is a stark contrast to how everyone else had trouble with just one Ultra Beats. One of the ultra beasts Type: Null fought is Guzzlord who almost hurt Lillie but just in the nick of time, Type: Null THROUGH THE POWER OF FRIENDSHIP... and possibly siblingry... evolves into Silvally saving Lillie in the process. Similarly in the anime, Type: Null evolves into Silvally by saving Lillie as well but unlike it's manga counterpart, it is one of the sources of Lillie's PTSD towards Pokemon which is also fairly interesting. So how does this attempt to copy Arceus turns out? It really comes down to your playstyle. As the title of this set mentions. This take on Silvally is meant to play on Silvally's original purpose, an Ultra Beast Buster. The Poison and Steel Memory are available options because it grants Silvally toxic and toxic spikes immunity while Ghost memory is just as good as many Ultra Beasts do not have good counters against pure ghost-types. Fire Memory is take into consideration for STAB Flamethrower however one may want to consider Fire Blast guaranteeing a two-shot KO against the monstrously good tank that is Celesteela. Due to Silvally's decent bulk paired with okay offensive attack stats, Silvally can also play the role as an annoying disrupter in many metagames where recovery moves and attack boosts are a must-have. Silvally is one of the offensive Pokemon to make good use of Heal Block which is especially a devastating disruption to Celesteela, easily landing two hit-KOs to Celesteela with Fire Blast and also doing three hit-KOs to Celesteel with Flamethrower. Flash Cannon is not recommended but is decent coverage against Fairy-types who are immune to Draco Meteor. What is almost ALWAYS recommended with a Silvally set is Parting Shot which allows a Pokemon to switch out while also decreasing a Pokemon's offensive stats which is good against Naganedel. Perhaps you aren't too concerned with Fairy-types or cutting off opponent's recovery power. Here are the last offensive moves Draco Meteor and Ice Beam and is one of the cases where you might want both. Silvally is currently one of two Pokemon who has access to Draco Meteor and isn't originally a Dragon Type. Draco Meteor is a strong one-shot counter against Naganadel and combined with Silvally's bulk, Silvally can tank one Draco Meteor from a one-stage boosted Naganadel. What Draco Meteor can't one-shot is Garchomp. Garchomp's outrage can two-shot Silvally giving it a chance to revenge kill Garchomp with Ice-Beam. Another thing you might want to consider is using the Ghost Memory due to it's good defensive properties against Dragon-types who are unlikely to invest in any ghost-type counters. With a water-typing and water-STAB, Silvally is good defensively amongst most OU Pokemon who aren't grass or electric-types and his STAB Multi-Attack is just as strong as his Iron Head against fragile Fairy-types such as Tapu Lele. Similar to the previous set, this is simply a ghost form of "The Enforcer" set. It may surprise you but one simple change to it's Ghost type changes a lot about Silvally's offense and defense power. For starters Ghost-types also have few weaknesses and paired with Silvally's defense, this is a good match. Also Ghost Multi-Attack is an even stronger physical ghost-type move than Decidueye's Spirit Shackle, making it feared among ghost and psychic types as many of them lack good physical defenses. With full invested 252 HP, Silvally makes a decent revenge killer against powerful ghost-types such as Timid Mega Gengar's monstrous 222 Sp. Atk at Lv. 50. A rather simple Silvally set that takes advantage of Silvally's offensive and defensive power through Last Resort. A fully-invested Adamant Nature Silvally with Life Orb can one-shot Naganedel with Last Resort. A Left Overs Impish Nature Silvally can take two-hits from a fully offensive Jolly Garchomp. This is overall a gimmick but it can work as a secondary attacker in doubles, being an unpredictable threat although it does have to deal with ghost-types and intimidate users of course. It may surprise you that Choice Scarf Silvally is surprisingly a dangerous suicide bruiser thanks to it's access to extremely powerful attacks. However in the end this is meant to be a gimmicky set. With STAB Hyper Beam your able to two-shot Pokemon such as Tapu Lele or Garchomp. One-shot if it's Choice Specs. It also faces some one-shot counters such as Mega Gengar's Focus Blast or Tapu Lele's Fightnium Z-move. Why would you want to use this? Although it is a suicide sweeper, it actually has enough bulk to take two strong attacks such as Garchomp's STAB Outrage and Tapu Lele's Focus Blast. The other reason is just for the fun of it. That's really the only reason you need as we all know just how bad Hyper Beam's drawback is. Honestly any other item is also fine, eg Electric Memory for STAB Thunderbolt, but I chose Flying Memory for its immunity to Earthquake and also to further bait common users of Silvally's moves. BoltBeam is nice coverage (not that you'll be doing any damage), takes attack options away from Tapu Koko and Fini (sometimes). It also had the amusing effect of completely shutting down the popular Porygon2 set at the time. Anyway, Silvally should get Imprison up ASAP then Protect every so often, while opposing attackers take shots at it in an attempt to get their moves back. I paired it with Garchomp and Gyarados to take full advantage of the absence of the other team's BoltBeam coverage.